are one of the collectible ranges produced by ENESCO. The first of the Mary’s Moo Moo herd appeared in 1994 and figurines continue to be produced. 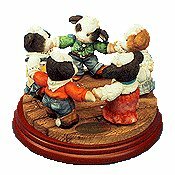 The figurines have attracted a number of dedicated collectors and ranges in the past have included a Country Wedding, and the Moo Moo County Fair. Mary Had A Little Lamb® and Mary, Mary Had a Farm®. 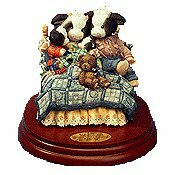 NOTICE – This site is not affiliated or associated in any way with Mary’s Moo Moos TM or ENESCO. The purpose of these pages is to provide information to collectors of Mary’s Moo Moos.